So, if you are still with me, and you still want to be a trailbuilder? I’ll lay out a few different ways to do it and the process that we follow today to ensure we’re compliant and your effort can last for generations like I talked about above. We’ll start with a theoretical you – you ride bikes and love the trails and like me, realized at one point that they don’t build themselves and you want to start building. Or else you see a trail that has been neglected, but it is your hands-down favorite trail and you want to see it returned to former glory. Also a good reason to get into building. Step 1: Contact your local trail association. They will have a general inbox of some kind ([email protected]). I’m writing this in the generic sense in the event that someone reading it wants to build in an area not covered by the FVMBA. In that initial contact, indicate your intentions for building – wanting to adopt a neglected trail, wanting to build a new line, wanting to help haul rocks – whatever your pleasure. We’ll take all kinds. You can offer feedback too on trail work you are seeing out there. Props are always welcome, but so is criticism. We at the club have relatively thick skin so please (respectfully) let us know your thoughts. From here, your inquiry will get routed to the right person for that region/network. Bear with us – this can take time and the ball may get dropped. Remember, most of us are volunteers and we do this on the side of our day jobs and our day lives so it’s not always our #1 priority. We’re getting better and better over time and we now have staff to field and direct the initial inquiry. If the ball does get dropped, feel free to be persistent. You won’t hurt our feelings by asking (politely!) a few times! Step 2: Work with whomever you connect with to meet up and discuss your intentions. Be warned – you may get an answer that you don’t want to hear. If the original builder of a trail doesn’t want it changed for example, you may get that answer. Or if you want to build a new line, that may not be feasible where you want to put it for a variety of reasons. These answers don’t come to rain on your parade. It is just the realities of things on the ground before you got here. However, if you come in with humble ambitions, the answer will likely be enthusiastic yesses and you will get asked to come help with some work here and there. Trailbuilders can be a funny bunch – think about it, most of them like to wander into the forest with a load of tools, food, and a beverage reward of choice, for hours and days at a time and be alone – so please bear with them as they come into the light of day to work with you and your idea. They are going to give you their feedback – not always sugar-coated either. Please know that they want you to rise to the level of building and experience they have and avoid making the same mistakes. It’s kind of like parenting. We (@FVMBA) are also working with our experienced builders to be more accepting of new builders to our fold (much like young kids) and know that all of us tend to have to make our own mistakes to learn important lessons. Building into the slope, crossing a runoff, without grade-reversals and/or drains? They’ll learn about drainage next winter. Using organic soil? They’ll learn when that corner lasts all of one serious West-Coast rain storm. You can tell them that 100 times, but sometimes you need to let these things sort themselves out! Step 3: From here, it forks out in a litany of directions. Want to build a new line? We’ll walk you down the road of getting prior, informed consent from all stakeholders on Crown Land before a shovel ever hits the ground. The quick version is: GPS the line, perform a TEST screening to check for any wildlife, water or other environmental interference, review First Nations Traditional Territory and land status and engage them for prior, informed consent to build trails in that area. Then submit application to the Provincial Government for approval on behalf of the FVMBA. Getting this approval can take 1-2 years. So patience is mandatory. 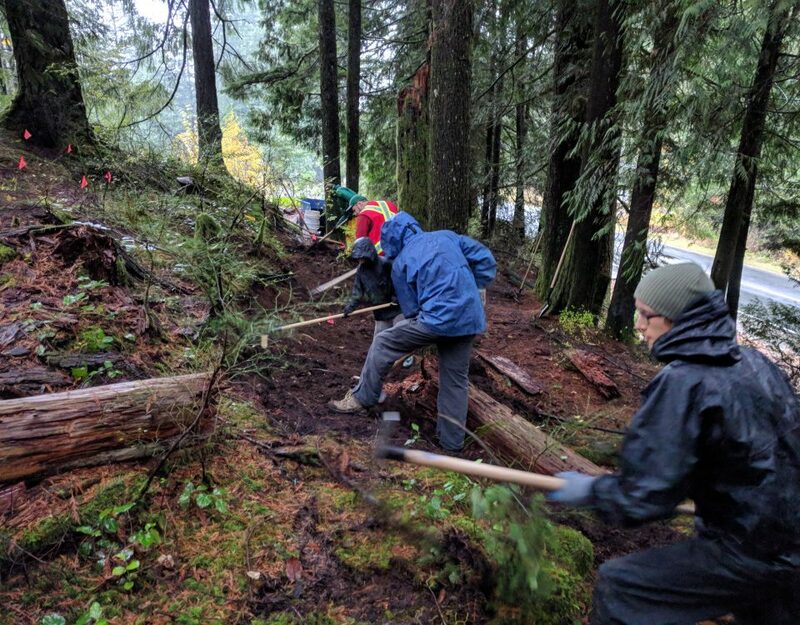 We as a club are at the Provincial table with the IMBA BC Council trying to work with all stakeholders to reduce this roadblock to what amounts to people wanting to volunteer their time to better their community. However, this is the process we must follow for all new trail building. We can’t follow the rules of the past because those rules didn’t include all stakeholders and is the reason we have so much legwork now to get all existing trails into good standing. All public trails are on borrowed land of some kind so we need to respect that moving forward. 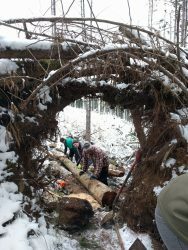 Step 4: While you wait for that paperwork to move (or if your original ambition is to fix up an old line), you can apprentice with one of our trail builders on an existing trail and/or adopt your own existing trail to learn the craft, and/or better your skills. There is no substitute for time on the tools and advice from people who have done it for decades so it’s a great thing that they want to teach. Some of them do, not all though. We’d be happy to pair you with a builder that does. We as a club will support you 100% in this endeavor with the hand tools & materials needed and any training you want to pursue. Want to use a chainsaw? We offer chainsaw safety training for our builders. Want to learn some builder basics? We partner with IMBA Canada to offer trail building classes to learn the fundamentals of building sustainable and lasting trails. Step 5: Start learning. Ask questions, but also try things. There isn’t a wrong answer if you are the adopted builder on a trail. You get to call the shots. But always remember the ‘4 hours per corner’ rule-of-thumb. If you took 20 minutes to fix a problem corner, it’ll last about that long in a rain storm with riders. Take the time, do it right. If you don’t know what right is, that’s OK. Ask questions. That is a great way to build inclusively and respect the builders before you too. Step 6: Engage the public. You are free to run trail days on trails where we are in good legal standing. Some of our trails this means established trails. Others are under a Letter of Understanding with RSTBC (LOU). Either way, as long as your trail is one of these – and we will only ‘assign’ you to one of these – then we can host volunteer trail days to work on them. You plan the day, figure out how to feed people and we’ll spread the word via our website, social media and email blasts to get the word out there. We’ll compensate you for your trouble – gas isn’t free and it takes time to plan these things well. Work with your fellow local builders to be able to put 10-30-50 willing souls to good use and feed them after and everyone will leave with a smile on their face, and a small legacy. They get to lay claim to one 4-hour corner! You get 40-120-200 man-hours of labour into your labour-of-love, your adopted trail. It may not all be just the way you want it. That is OK – you can tweak afterwards. No one will complain. And if they do, we have your back! This is one of a few ideal ways for a new person to a scene to get into trailbuilding in the area. There are a few other ways to ply the trade, but it all starts with a conversation. Contact your trail association and we’d be happy to have a chat about what your goals are and how we can support you in your efforts. Sadly, so many times this is what we see happen: New builder-to-be comes into a trail network and decides they want to fix a corner, or an entire trail. They buy their own supplies and volunteer their time to do what they think is a good job. It may even be a good job as they might be a landscaper for a living, or have built great trails elsewhere. However, the incumbent builders don’t take favorably to this and react in a variety of ways. They will remove unsafe construction with club support as we do have a duty to ensure the trails are safe. They will approach the new builder and generally, the discussion is pretty unsavory. The incumbents are defensive due to the lack of consultation on their trails, and the new builder thinks they are doing good things and can’t understand how anyone can be mad about this. I’ve seen it from both sides and it boils down to a misunderstanding. But it sours both sides and does no good. The alternative is communication. Reach out to FVMBA (or your local club) and ask questions before you start digging. Legally, you should be doing that anyway with the land manager unless you own the land. And in that case, it is your land – fly at it! 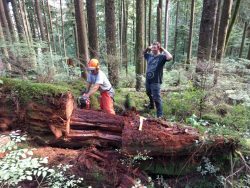 But for Crown Land, Park land, City property – basically, anywhere that you aren’t the private landowner or you have their consent – you need to consult a process to do any trail work legally. And we at FVMBA are here to support you and all volunteer trailbuilders. Our informal policy on builder support is the volunteer builder is always right – period. 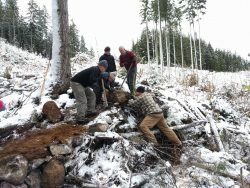 When disputes arise, as long as everyone is playing within legal boundaries, then we will side with the adopted builder of a trail. Don’t like the work they are doing in a given section of trail? If they are giving their time and effort and have gone about it the right way as prescribed above, we have their back. You want a say? Don’t voice it on the internet. Everyone knows that online trolling like that is the easy way out, and ultimately an ineffective and unconstructive way for people to voice their concerns – see the Wayback post in Part I. Come talk to us. Talk to the builder. Be respectful. You are absolutely entitled to your opinion, but so is the builder and on their trail, their opinion is worth 100 points to your 1. Get 100 friends to agree with you and maybe the builder will start to see it your way. And if they still don’t, then we still have their back. We will happily walk you down the process of legally building your own trail – we’ll buy the shovel too! Please keep in mind this does not come from a place of ‘masterminding’ or ‘owning’ the trails. The FVMBA is a vehicle for an area and the trailbuilders specifically to use to benefit their mountain bike community. The club doesn’t own any of the trails – the builders do in spirit, but ultimately the landowner owns any given trail. So, we all need to work together to be respectful of everyone’s wishes and concerns. 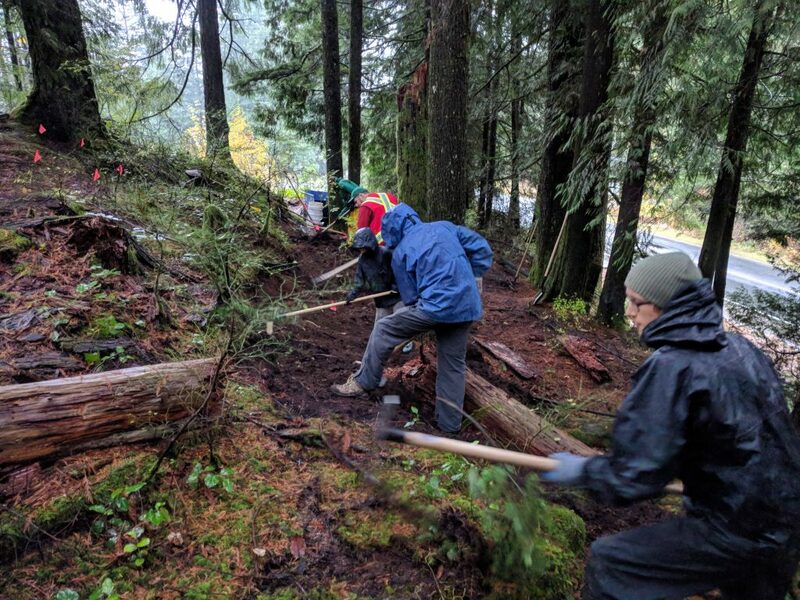 And when a trail is un-adopted, the club does inherit that responsibility, but all of those orphan trails are looking for a good volunteer trailbuilder to give them the love and attention that makes them so great. As they say, trails don’t build themselves, but they also don’t maintain themselves, drain themselves, trim themselves – you get the idea. It takes a village and a few leaders within that village to ensure no trail gets left behind. Want to be one of those leaders? Drop us a line, we’ll be stoked you did. Whats happening on the Shore is that the local club has taken over the trails for paid builders only. 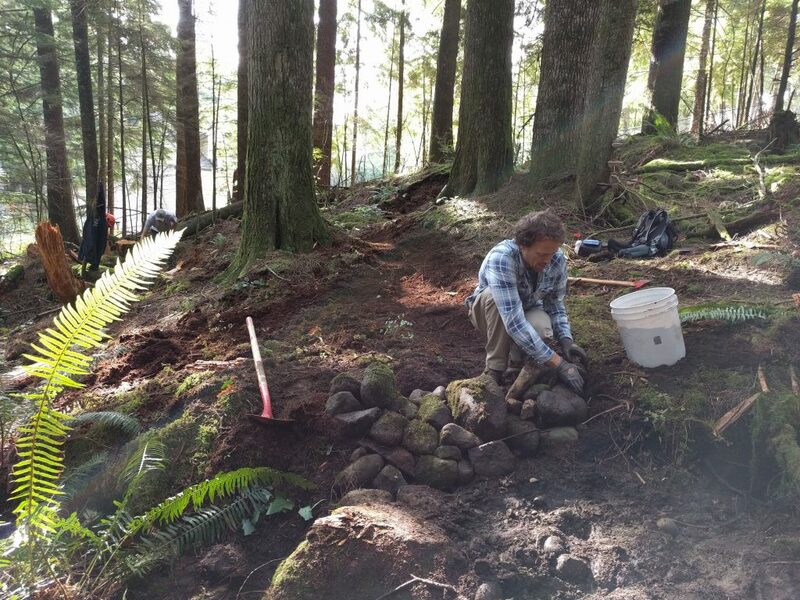 The only way to volunteer is to show up on a trail day to be told what to do by a paid builder – no creativity, only paving over roots and pulling rocks. Every trail is starting to look the same in the name of ‘sustainability’ which is disheartening for those of us who like challenging trails. Thanks for the feedback Mark. I can’t speak for the folks from your club, but I can say my own personal philosophy is that we stand on the shoulders of giants – the volunteer trailbuilders – and everything we do should be to enable and empower them to do what they do best. When they do, the art and wonder that comes with it is worth every ounce of effort. I can also tell you that striking a balance between what land managers and the riding public want to see in a trail is a real challenge and it takes great effort to ensure we retain the ‘gnar’. Our team is working hard to keep it gnarly in the Valley wherever we can. That’s a somewhat narrow perspective on what’s happening on the North Shore Mark. What you’re forgetting is that the Land Manager is in charge. Paid or not, the Land Manager tells us builders what we can or cannot do. And if you want to be more then a volunteer who just shows up at a trail day to be told what to do then you need to get involved. Show up to the trail day, say you want to do more, attend some meetings, and most importantly: do the paperwork.